A good chunk of bread forms a tasty cornerstone of any light lunch or meal, and has done so for centuries. Bread making could easily be considered as somewhat of an art form, truly mastered by few and tried by many. Bread took a bit of a hammering in recent years, thanks in part to carbohydrate counting faddy diets. 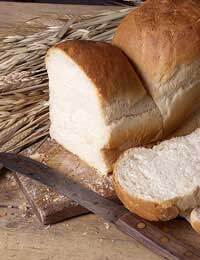 But thanks to sharp rise of more 'healthy' bread options, such as wholemeal, wholegrain, oatmeal and malted loaves, bread is back. The very idea of baking bread may bring about feelings of homeliness and domestic bliss - even just the smell of baking bread is extremely evocative. Sometimes nothing beats sitting down to lunch and tearing open a warm, fluffy homemade roll, or creating a monster door-wedge sized cheese ploughman sandwich, using freshly baked bread. Bread can be a little more exotic too - there are recipes that incorporate tropical twists such as coconut and chocolate into the mix. But as a bread-making novice, before you start experimenting you'll need to master the basics. This article takes a look at how to make a basic bread recipe. Before you start baking your bread, it's vital that you understand the ingredients you're dealing with, and the part they play in making good bread. Yeast - a living micro-organism that feeds on the sugars present in flour. As a product of the consumption between the yeast and sugars, bubbles of carbon dioxide are produced. These form air pockets in the dough which, when baked, form the distinctive texture of the bread. Water - one of the most important ingredients in dough. A variance of around 50ml of water per 500g of flour can make the difference between smoother, tougher and firmer dough used for farmhouse cobs or a softer, more pliable and flaccid dough perfect for shallow baps. Flour - too much flour can make for a tough, heavy bread. This is why adding too much flour when rolling it out can actually affect the quality of the baked bread. The flour needs time to absorb the water, so leaving the dough mixture for about quarter of an hour should allow time for a tacky texture to become more smooth. Before kneading the bread, also bear in mind that putting a dough mixture into the fridge for a few hours (or overnight) will slow the yeast action, making for a less stale loaf. Strong Flour - Strong flour is ideal for bread baking as it has a higher gluten content than plain flour. 1. Put the yeast, sugar, salt water and flour into the mixing bowl and combine. Then make a well in the middle of the mixture, and carefully pour in the water. The water should then be mixed in with a wooden spoon, until such time as you can work it with your hands. You may or may not need to add small splashes of water, depending on the dough's consistency. 2. Once the mixing bowl is almost clean of flour, transfer the dough mixture onto a clean work surface. Be careful if you choose to flour the surface, as the added flour can make the bread heavy. An alternative is to use a little vegetable (preferably olive) oil on the surface to stop adhesion. 3. You can then start kneading the bread until it becomes elastic - you shouldn't need to knead for more than 5 minutes - and then transfer back into your mixing bowl and cover with cling film. Make sure to leave the dough at room temperature for a couple of hours at least, until the dough has visibly 'grown' to more than twice the original size. Putting a small amount of cooking oil onto the cling film will stop it sticking to your dough mixture. 4. After the 'rest' period, you'll need to knead the bread again for two or three minutes to help rid of any air bubbles that have formed. The dough can then be rolled out into an oblong shape to fit the loaf tin. 5. At this point you should start preheating the oven to 450F or Gas Mark 8. The dough can then be placed in the pre-greased baking tins (make sure that they are greased liberally) and left at room temperature for 60 minutes. You will notice that the dough continues to rise during this time. Ideally the dough should have risen enough to poke over the top of the loaf tin before being placed in the oven. 6. Bake on the middle shelf of the oven for about three quarters of an hour. The way to test if the loaf is cooked all the way through is to tap the base of the loaf. If it sounds hollow then the loaf is ready and can be removed from the loaf tin upside down. For extra crustiness, the loaf can be put back in the oven out of the tin for a further 10 minutes or so, before removing and leaving to cool.